I got a RSC13 quilt top done at retreat last weekend. My mom and I went to a retreat run by my aunt (Smiley Quilter). It is four days long, so I got lots done. I had to finish four more blocks and then I got the top put together. It measures 45" square. I do not think I will put a boarder on it. Maybe just quilt it after Christmas. I am busy quilting for customers between now and Christmas. Close up of the piecing and fabrics. I worked on some black scraps this past week. I love doing this Poverty Piecing (crumb blocks). I find it hard to stop sewing the little bits together. They are just so additive to sew. I did 7 black ones but then counted up all that I have done this year. 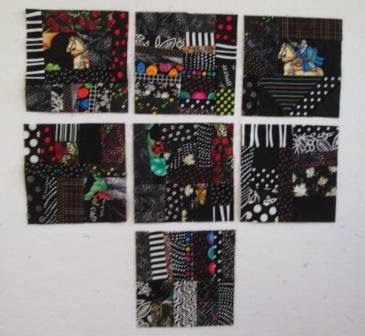 So far I have over 70 blocks 6" sq each. I am going to a dog agility fun trial later today. Should be fun. I love how that quilt came out. You blocks are great. Those poverty blocks are addicting. What are your plans for them? In all the busy of the retreat I missed seeing your RSC top completed. I love it, will have to make sure I see it at Christmas. I have added that block to my list of things to do. I love crumb piecing also and agree that it can be addicting. It's fun to remember what all the scraps came from. I'm glad you told me they are 6 inches. They sure look larger! 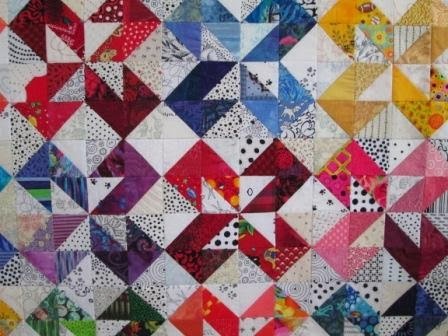 I use most of mine as I go into donation quilts but am thinking I'll start saving some for a rainbow quilt. Love how your RSC flimsy turned out! The black & white print background fabrics add really nice POP to everything! Oh Cathy, this quilt is beautiful, and your little black blocks are cute too. Your blocks look fabulous together! It is amazing what can happen when you sew with scraps! Your quilt and blocks look fantastic. Love both your projects, Cathy! So colorful and fun. II should so some poverty blocks. 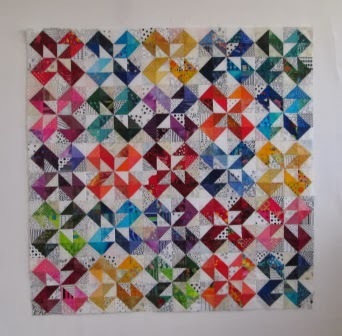 How do you plan to piece them together into a quilt? I love both of your projects. The wonderful rainbow quilt is beautiful. I am addicted to poverty piecing too, the rainbow blocks will make such a nice quilt in the end though, just te right balance of freedom and planning. Great finished top! Such a fun collection of background fabrics. Love these... I am thinking some of those HST blocks are in my future next year~!